With January already here, many truckers across the U.S. have likely run into icy roads, high winds, snow and poor visibility conditions. Inclement conditions are likely to continue for the next two or three months in most parts of the country, and it requires drivers to brush up on their safe winter driving know-how. Dangerous weather patterns are already forming in mountainous regions and other western states, meaning that drivers should be aware of the risks they may face when they hit the road, according to Freightwaves. While many of these places may allow trucks to drive with tire chains, some might not, so it's always a good idea to check the rules of the road for any state into which you're planning to travel, as well as the forecast for any roads you're likely to take on your drive. Even if it's only raining in a place you're heading - or just planning to pass through - that might not be the case when you actually get there, Freightwaves further advised. Rain can mix with existing snow on the ground to create a dangerous slushy mixture, or can simply freeze when temperatures drop to create black ice. 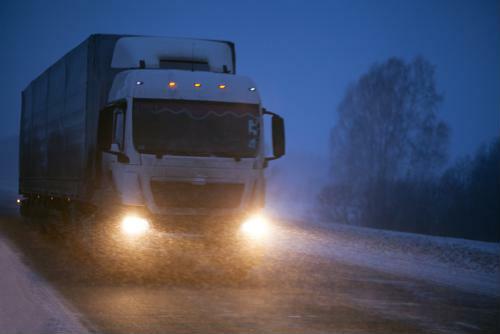 Rain or a wintry mix may also turn to snow over the course of a few hours as weather patterns change, so it's important for truckers to check the forecast for their trip on a regular basis, simply to avoid driving into a situation for which they are unprepared. Everyone knows it's never a good idea to speed when roads get slick, but the same is also true of jamming on the gas or brake pedals, according to travel expert Tom Stienstra, writing for the San Francisco Chronicle. Especially on inclines, if tires are spinning too much all of a sudden, it can cause a vehicle to lose traction. While distracted driving isn't a good idea at any time, it's especially dangerous in winter and therefore requires greater vigilence, Stienstra advised. That means your eyes should be on the road at all times, hands at 10 and 2, and all the other defensive-driving tips experts preach need to be followed to the letter to not only avoid losing control, but also make sure it's safe for other drivers. Any time drivers are pulling off the road due to poor travel conditions, they have to be mindful of the risks, Stienstra said. Only parking in well-lit, safe areas - i.e. not on the side of the road - is always a good idea, unless conditions are so rough that they absolutely dictate stopping is necessary. Of course, pro haulers often don't need to be told how to drive as safely as possible, but it's always a good idea to make sure they're brushing up on the basics so they don't make a simple, avoidable mistake.